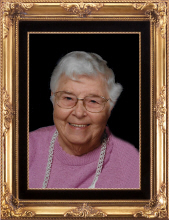 Martha R. Stumpf, age 93 of Pemberville, OH passed away Wednesday, March 27, 2019 at her home in Otterbein Senior Life, Pemberville. She was born on January 1, 1926 in Pittsburgh PA, to William and Mary (Elder) Reiter. On August 23, 1947 she married Frank G. Stumpf in Lakewood, OH. Martha and Frank raised 3 daughters and celebrated 69 years of marriage before Frank’s passing in August of 2016. Martha graduated in 1947 from Denison University with a Bachelor’s of Science Degree and went on to be a teacher for a number of years. In her younger years she enjoyed bowling and even played the wii version of the game today. She was an accomplished artist, enjoyed knitting, crocheting, gardening, crosswords and sang in various church choirs throughout the years. It was her family, her children, grandchildren and great-grandchildren that gave her the most joy. Martha is survived by her daughters: Barbara (Carl) Voigt of Gray, TN, Susan (John) Hughes of Woodville, OH, M. Lynn (Douglas) Krucinski of Lorain, OH, grandchildren: Becky Dyer, Jared Voigt, Liz Gleason, Nathan Voigt, Tim Voigt, Sarah Kuhlman, Carrie Lakin, Steven Krucinski and Dennis Krucinski, great-grandchildren: Luke, Jason, Rachel, Megan, Jon Oliver, Maddie, Jacob, Grace, Paul, Julia, Petra, Nathan, Emma, Lliam and Remy. In addition to her husband Frank, Martha was preceded in death by her parents, grandson: Jeffrey Hughes and her four siblings. Family and friends will be received from 6-8 p.m., Monday, April 1, 2019, at the Marsh Funeral Home, 201 West Main Street, Woodville, OH. Funeral services will be conducted 11 a.m., Tuesday, April 2, 2019 at Woodville United Methodist Church, in Woodville, with additional visitation from 10 a.m. until time of service. Officiating will be Pastor Kent Winkler. Interment will be in Westwood Cemetery, Woodville. There will be a bereavement luncheon served in the church fellowship hall immediately following the cemetery committal service. Memorials may take the form of contributions to: Woodville United Methodist Church (Missions) or Otterbein Senior Life. Those wishing to express a word of encouragement or share a memory or photo may do so at www.marshfuneralhomes.com. To send flowers or a remembrance gift to the family of Martha R. Stumpf, please visit our Tribute Store. There will be an additional time of visitation from 10 a.m. until time of service. Officiating will be Pastor Kent Winkler. There will be a luncheon served in the church fellowship hall following the cemetery committal service. "Email Address" would like to share the life celebration of Martha R. Stumpf. Click on the "link" to go to share a favorite memory or leave a condolence message for the family.